Trend(Watch): Designed in California – Made in Switzerland! celebrating the Historic California-Swiss Innovation- and Pioneer Spirit! and let jeff(at)xetum.com know we sent you! On Friday evening I was priveleged to attend the book signing for Westward by Swiss author Susann Bosshard-Kälin at the Robert Mondavi winery. The book revolves around 15 portraits of Swiss women who immigrated to the United States in the 20th century. “The fifteen stories show women standing between two worlds, two cultures, and two languages, – but above all people who have shaped their lives and world with a zest for life, with humor, courage, equanimity, and wisdom.” The event specifically honored two of the California-Swiss women interviewed in Westward, Anna Conti-Tonini and Margarit Mondavi Biever Kellenberger. The event was held in a private room at the winery which opened onto a breathtaking vineyard. The sun set slowly over the hills, bathing the room in an amber glow as friends of the honorees mingled and drank wine. After conferring with Schelbert at his home near Chicago, Bosshard-Kälin went on a muli-year journey across the U.S. in search of unique Swiss immigrant stories. One of her daughters also tagged along and is responsible for the wonderful photos within the collection. Bosshard-Kälin’s collection of interviews are both touching and inspiring. They are a testament to the human spirit and should not be missed. Copies of Westward can be purchased through the Swiss American Historical Society, Book Editor, 2523 Asbury Avenue, Evanston, IL 60201. One of my favorite spots in Northern California is the Square in Sonoma. It is right in the heart of Sonoma wine county, is a great place for a picnic with the family and is rich with history. The square was the Pomo and Miwok Indians’ sacred meeting ground, the site 1846 Bear Flag Revolt and home of California’s Northern-most mission. On the North side of the square sits the Swiss Hotel. The structure was first built by Don Salvador Vallejo, brother of Mexican General Mariano Vallejo. 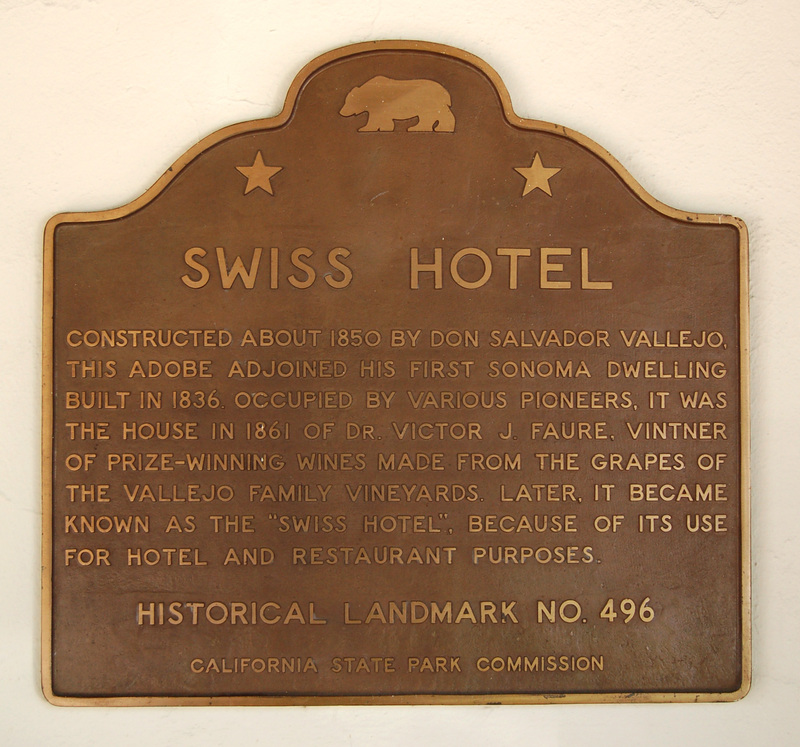 It was later occupied by various pioneers and in 1861 became the house of Dr. Victor J. Fauré, French-born vintner of prize-winning wines made from the grapes of the Vallejo family vineyards. Its life as a hotel started as a stagecoach stop in the 1870’s. 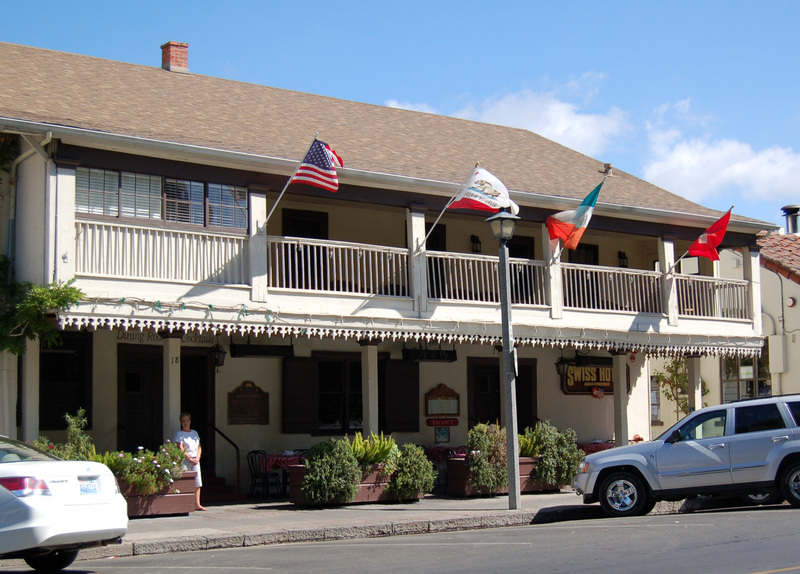 In 1882, it was purchased by the Toroni family and was initially called the Ticino Hotel, serving railroad passengers and employees who stopped in Sonoma for the night. It would later become the Swiss Hotel in 1909 when an establishment of the same name on the West side of the plaza burned to the ground and the Toroni’s took the name for themselves. Hank Marioni is the fourth generation of his family operating the Swiss Hotel as a hotel and restaurant. 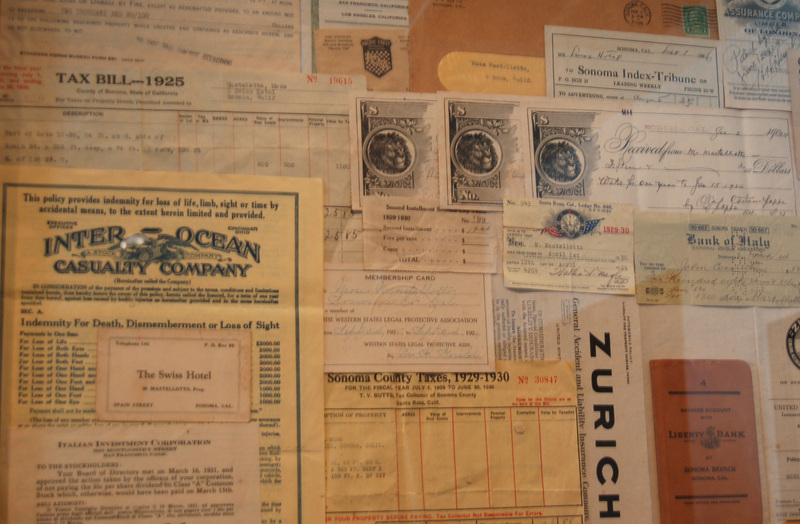 The interior lobby is adorned with family photos, deeds, tax bills, and even a birth certificate from Ticino. It has a wonderful back patio and has a great old California feel. It is a wonderful piece of California and Ticinesi history. 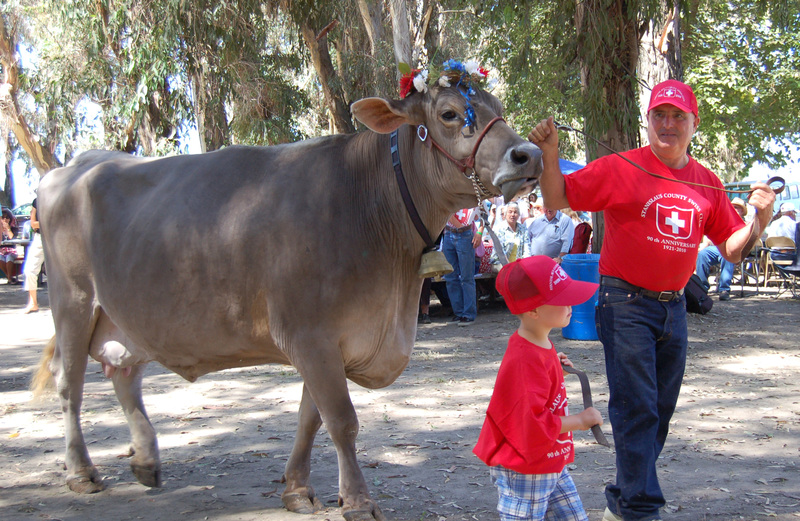 Just south of Modesto in a eucalyptus grove nestled between corn fields and diary farms stands the Stanislaus County Swiss Club. The club which was founded in 1920, celebrated its 90th anniversary this past Sunday. I was lucky enough to be seated next to Janiene Yori, granddaughter of Antone Yori after whom Yori’s grove is named. Yori had donated the land in 1920 to start the club. 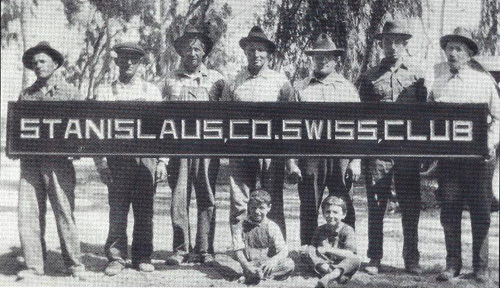 At the time all Swiss from the San Joaquin valley, primarily Italian Swiss and German Swiss came to the club. During his speech on the background of the club, Ed Sciarini made mention of a rift that would eventually occur between the Ticinesi and the German Swiss in matters of honor and sport surely fueled by too much local wine. As a result of this rift the Stanislaus County Swiss Club is mostly Ticinesi while the San Joaquin Valley Swiss Club in Ripon is mostly German Swiss. That being said, the 90th anniversary event at Yori’s Grove was truly a Swiss event. There was accordion music, talerschwingen, a Swiss wrestling demonstration, and a parade of cows. 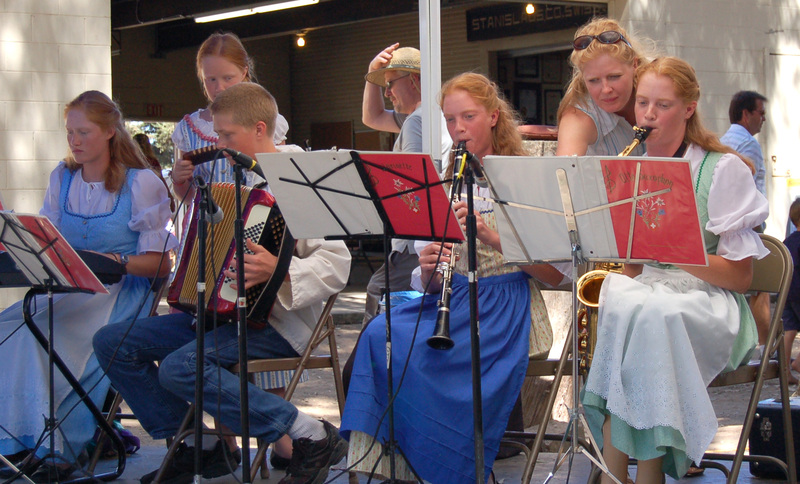 In a scene reminiscent of the Sound of Music (Austrian reference I know, stay with me), came the terrifically talented Ott family whose children sang, played music and yodeled all the while in traditional Swiss attire. It was a memorable event, and as a newcomer I was treated with great warmth by all those I met. I came away feeling that those in attendance were proud of their Swiss heritage and wanted to stay connected with Switzerland. For those in Switzerland who may not understand what the Auslandschweizer mean to Switzerland, I think this club is a great example of what needs to be celebrated.